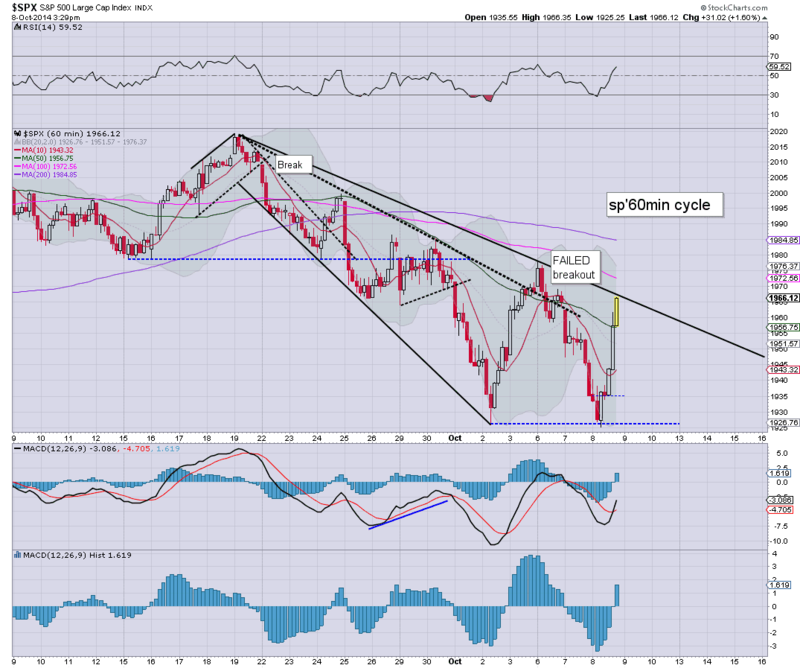 US indexes broke a new cycle low this morning of sp'1925, but ended up soaring, settling +33pts @ 1968. The two leaders - Trans/R2K, settled higher by a very significant 0.9% and 1.9% respectively. If the Monday high of 1977 is broken over, t will be white flag waving time. Pretty much a crazy fed inspired 'we're concerned about....don't worry about us raising rates'. There sure were some wild price moves out there, not least in the miners.. but see my 'fair value' page for more on that sector. The daily index candles are of the bullish engulfing type.. with a pretty strong spike-floor. Arguably, the last line in the sand is sp'1977.. after that.. there is only the 2019 high. *I'm still not running on 'full power' you could say, hell, I didn't even remember the FOMC minutes were due at 2pm today. Hopefully I'll be fully recovered by next week... urghh. I'll post something to wrap up the day at 8pm EST. With the FOMC minutes convincing the market that the Fed now wants a soft USD... its spooked almost all equity bears.. and a rather huge short-stop cascade has occurred, lifting the market from an early low of sp'1925 to a recent peak of 1961. Crazy...... pure crazy. One of the strongest hourly ramps we've seen in some time..
Equity bears MUST hold a daily close under descending trend..currently 1965.
Notable HYPER strength: miners, GDX +5.6%... the biggest gain I can remember in a VERY long time.... However, GDX break the 2013 low.. earlier this morning. 3.14pm... Well... a simple Fed press release.. and havoc across the US capital markets. The move in the miners will no doubt get some serious attention this evening... and no doubt the floor callers will be out again (although seen one)... but unless you think metals have floored..just a few days ago... then its makes ZERO sense to assume miners have floored. 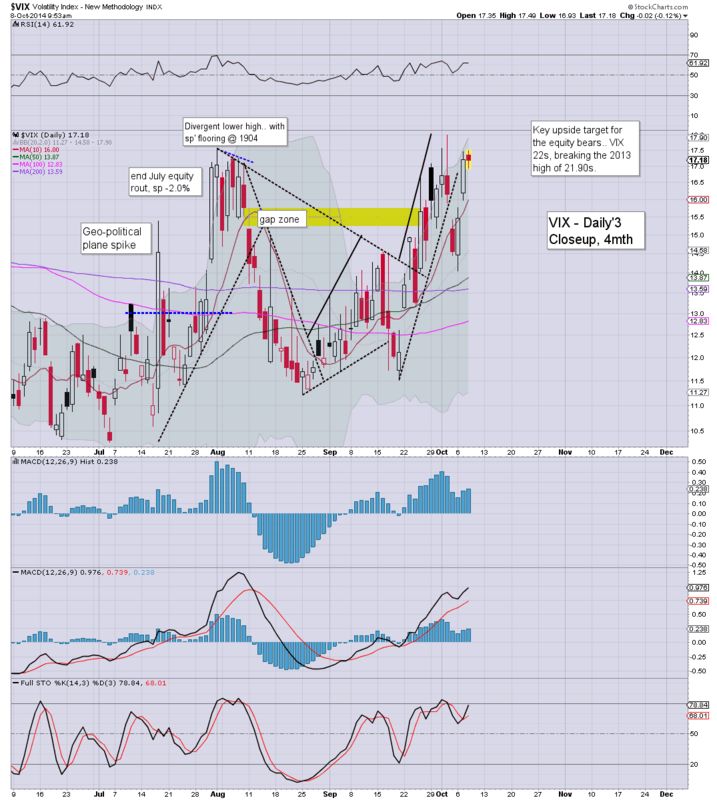 VIX -10% .. 15.40s. .and the earlier 18s now look a long way up...even with 2 days left of the week. A daily close >1965 would be a problem for those in bear land... although that seemed the case early Monday morning. 3.37pm.. Bullish engulfing candles ALL over the place on the daily charts... bodes VERY badly for bears. A daily swing of 41pts (2.1%).... disturbing.... with VIX -12%.... 15.10s. 3.43pm.. .sp'1968.. .and there goes trend/resistance... next level is the Monday opening high of 1977. GDX +8.1%.... biggest gain I remember since the 2011 bubble peak. US equities are moderately higher, with a little short-stop cascade underway. Regardless, a new cycle low of sp'1925 has been achieved, with confirmation via VIX 18s. As has been the case since the Alibaba IPO... bounces are to be treated as just that... bounces. *typical turn time is 2.30pm of course.. so lets see if this latest nonsense wraps up then. Holding to target downside of 1915/10.... the August low of 1904 is VERY viable, with still 2 trading days left of the week. 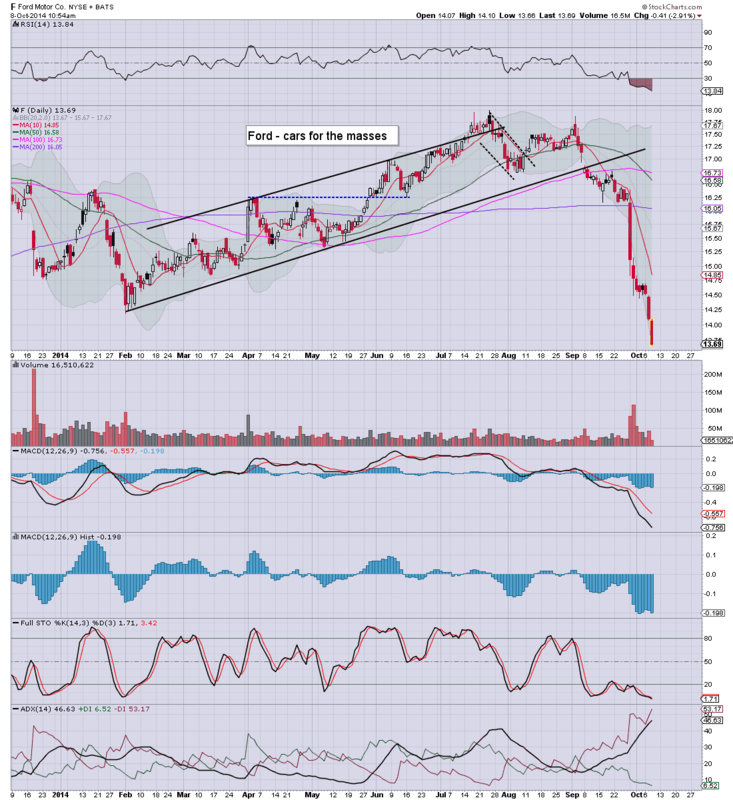 Notable weakness: CHK -3% @ $20... like most in the energy sector, its getting crushed. Seriously though.... almost 2.30pm... cyclically... we tend to max/floor then. 2.29pm.... being so ill.. (yeah, its true)... I had completely forgotten that the Fed maniacs issued an FOMC press release at 2pm. Regardless.. its now typical turn time. The sp'500, along with other indexes have taken out last Thursdays low of 1926, with the VIX breaking into the 18s. Overall price action remains bearish, with next key support in the 1915/10 zone... a test of the 1904 low looks equally viable.. by Friday. 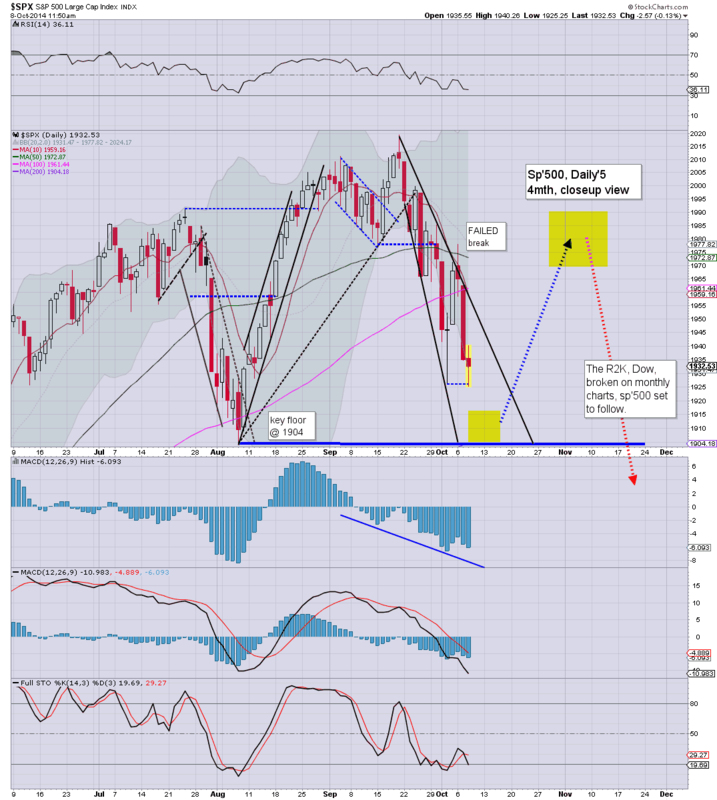 *with the recent weakness, I've added my primary H/S scenario/outlook to daily'5 chart. It will get ditched on ANY break above sp'2000. Similarly, if we just keep falling <1900... will have to reassess, but the latter looks especially unlikely. 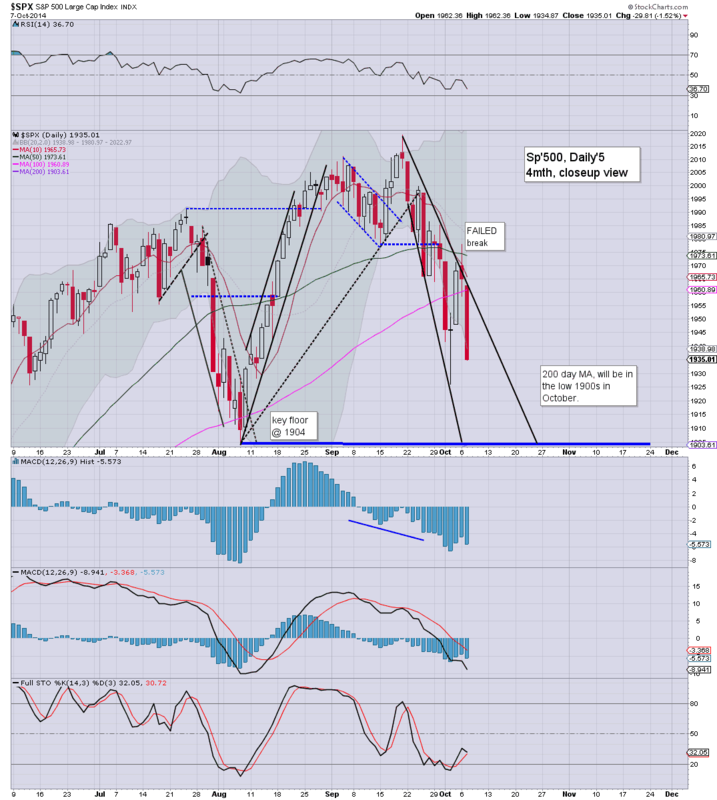 So...we're broken the 1926 low...and another 15/10pts look a given. With still two full trading days left of the week, a full test of the Aug' 1904 low looks likely... and from there.. we'll likely snap back higher. 12.50pm... minor chop..... i see out there calling for a sig' bounce.. to 1950/60s... but to me, that makes little sense. Equities see renewed weakness, with the sp'500 currently back to the low from last Thursday... it will not likely hold. Metals are back to flat, whilst Oil is significantly lower, -1.7% in the $87s...headed for $80. ..since we have some more downside....I'm back an hour earlier... the bed sure is tempting though. 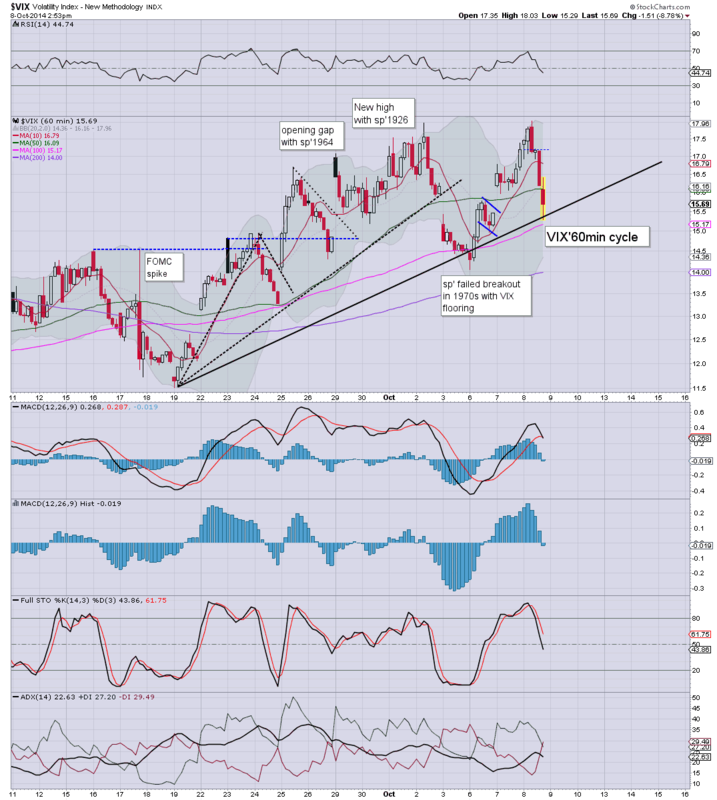 VIX is confirming the ongoing weakness, +3% in the upper 17s. We look headed for the lower weekly bollinger - a particularly favoured target of mine in any multi-week down cycle... that is currently at 1912. 11.04am... Last Thursdays low...taken out across at least two indexes.. R2K, SP. US indexes start the day with some minor chop, breaking lower to 1933, but quickly jumping to 1940. On no basis though do the bulls look able to push significantly higher from here. A test of 1926 looks a given...and should fail.. opening up 1915/00 zone by Friday. Equity bears shouldn't be concerned at the currently red VIX... 18/19s look a pretty comfortable target... whether later today.. tomorrow, or Friday... it should make little difference. It remains the case that bears probably only have until this Friday to push lower, until the next up wave - which I'm still guessing will hit at least 1970/90. Good morning. Futures are a little higher, sp +5pts, we're set to open at 1940. Metals are moderately higher, Gold +$6. Oil remains very weak, another 1% lower in the $87s. Equity bears should be able to contain any opening gains, before the 1920s at some point today. So... we're set to open higher, but after the Tuesday declines, a break below the sp'1926 low looks VERY likely today. Indeed, many out there are now looking for a full test of the Aug' low of 1904. I'm not sure if we'll make it that low this week, but we should at least get into the 1915/10 zone. Indeed, Mr C is starting to allude to a bigger cyclical change.... interesting huh? I realise some of you get real pissed that I dare highlight him, but he has been on the correct side for a good 5 years. Something I've been looking for - from a number of people I follow, is the consideration that a bigger cycle turn is in. As I noted in my overnight post, even the current down wave has been choppy, and inconsistent.. along with a subdued VIX. Since the key low in Oct'2011, that is indeed the sort of price action we've seen... but for the first time since then...the broader monthly cycles are effectively exhausted...and are rolling over. The R2K is 100% BROKEN, probably headed for the low 900s...I'm not sure if that would equate to sp'1750.. or 1650. Regardless.... would anyone dare suggest this is going to new highs before at least testing 1000... if not 900? So... lets see how long it takes for the bulls to fail today.... a daily close in the 1920s seems very likely, along with VIX 18/19s. Good wishes for Wednesday trading. 9.06am... Indexes ALL turning red in pre-market.... we could be testing 1926 by 11am. Whether it holds on the first test... not important. ..watching CNBC.... borderline hilarious to see how some of them seem genuinely rattled after yesterdays declines. 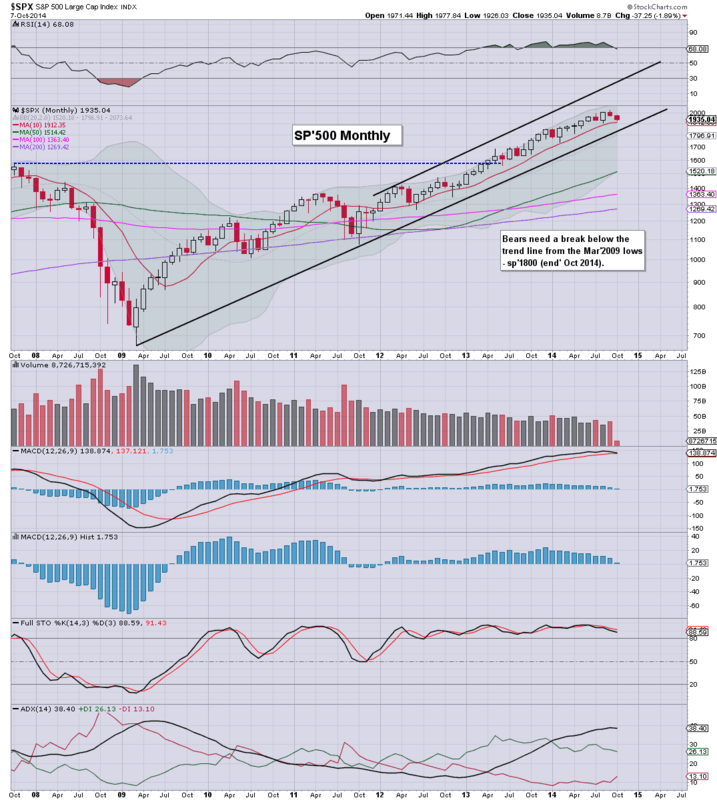 I'm almost amazed they aren't crying, and demanding QE4 starting Nov'1st. US equities closed lower for the second day, but still, the market is only 4-5% below the historic highs. 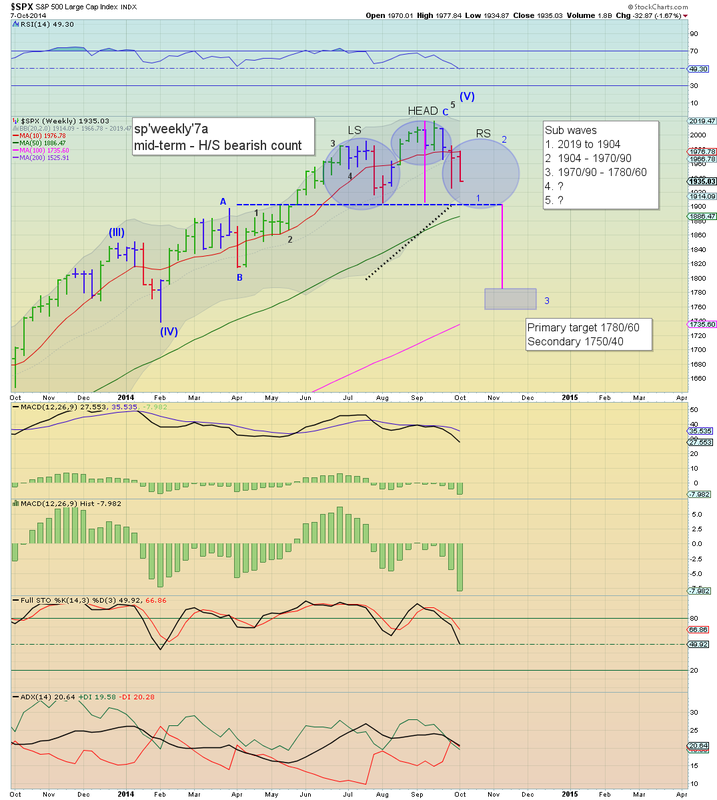 If equity bears can knock the market to 1910/00 within the remainder of this week, there is a very valid bearish H/S scenario into year end. So... the weekly 'rainbow' candle remains red... and trend is still suggestive of a hit of the lower weekly bollinger.. in the low 1910s. Certainly though, I don't expect a break under 1900.. with continued downside in the current down cycle. Seriously... can we break <1900 before year end? Recent price action has been somewhat bearish, but as ever.. the down waves are still not that consistent.. and the VIX has remained relatively subdued in the teens. 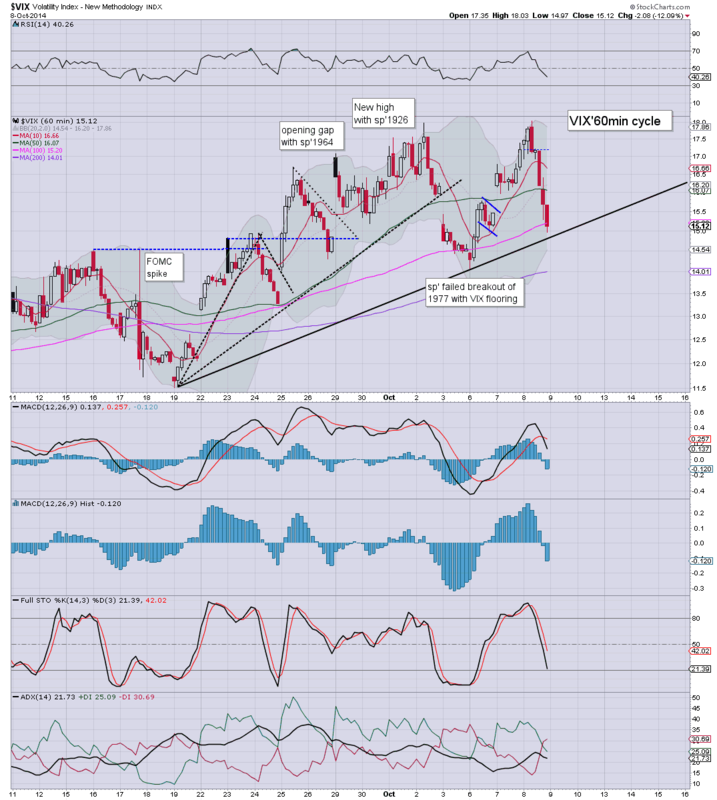 From a trading perspective... late Oct/early Nov... its pretty simple.. if we're stuck in the 1970/90 zone.... I will short with a stop somewhere in the 1990/2000 level. If I'm right about the formation... a blue'3 wave will complete within 9-13 trading days... with downside of around 200pts - roughly 10%. ... but frankly, that seems next to impossible in this market. Who won't be buying in the 1800/1700s... assuming we even get low? 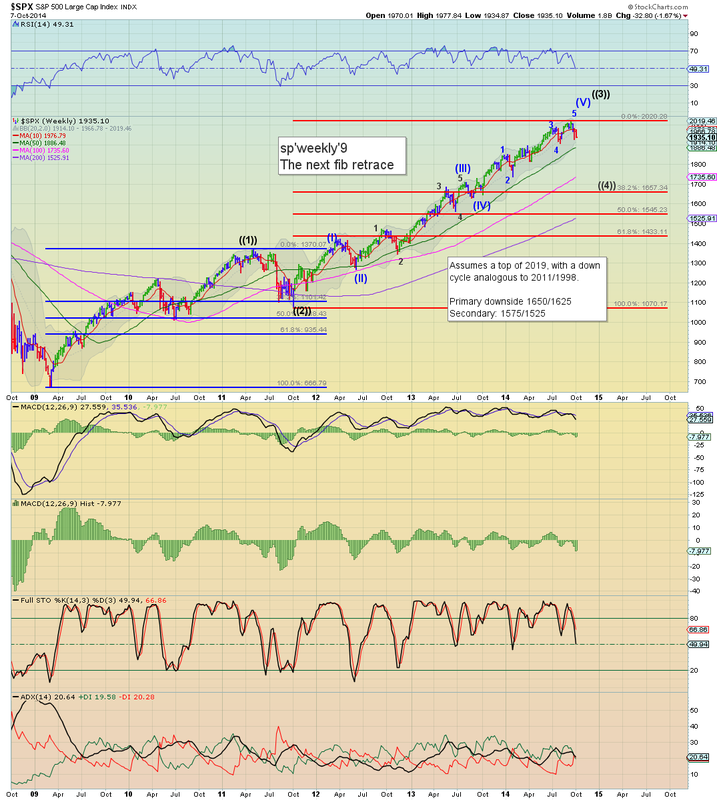 So.. Riley - like Carboni, and some others are still gunning for the sp'2100s within the next few months. 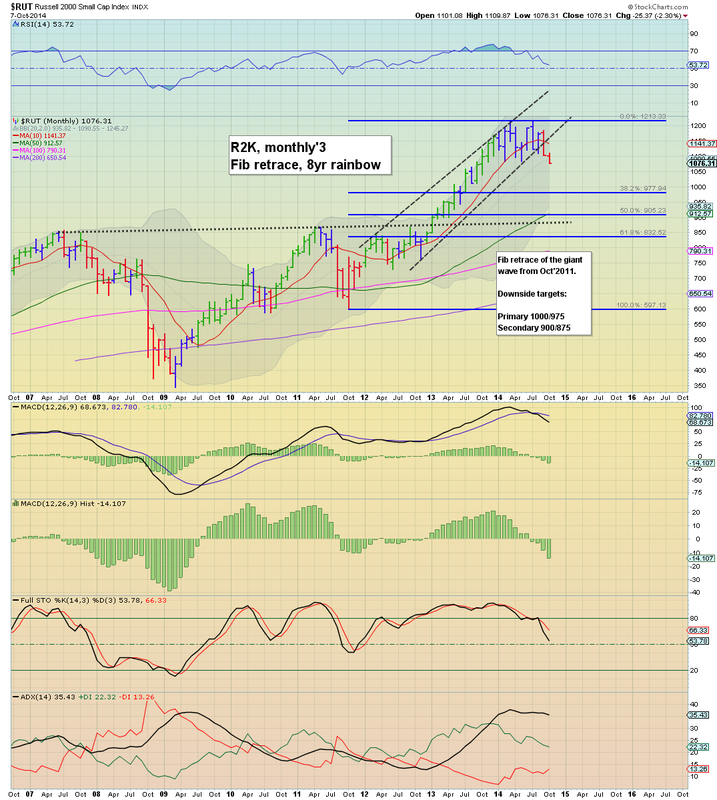 I'd be in agreement with them, except the monthly charts - not least the R2K and Dow, are already broken, and bode for further weakness... rather than new highs. The only thing of note tomorrow are the FOMC minutes... but then, I don't expect any surprises in that. No doubt the market will be a bit twitchy ahead of the press release though (2pm). *next QE is not until next week, and I will be glad to not have to note the figures once QE3 concludes end month.